The taciturn special counsel's office issued a rare statement faulting a news report that said President Trump had told his former attorney to give a false explanation to lawmakers on Capitol Hill. "BuzzFeed's description of specific statements to the special counsel's office, and characterization of documents and testimony obtained by this office, regarding Michael Cohen's congressional testimony are not accurate," said spokesman Peter Carr. The Thursday report cited two law enforcement officials with direct knowledge of the Trump Tower Moscow investigation. 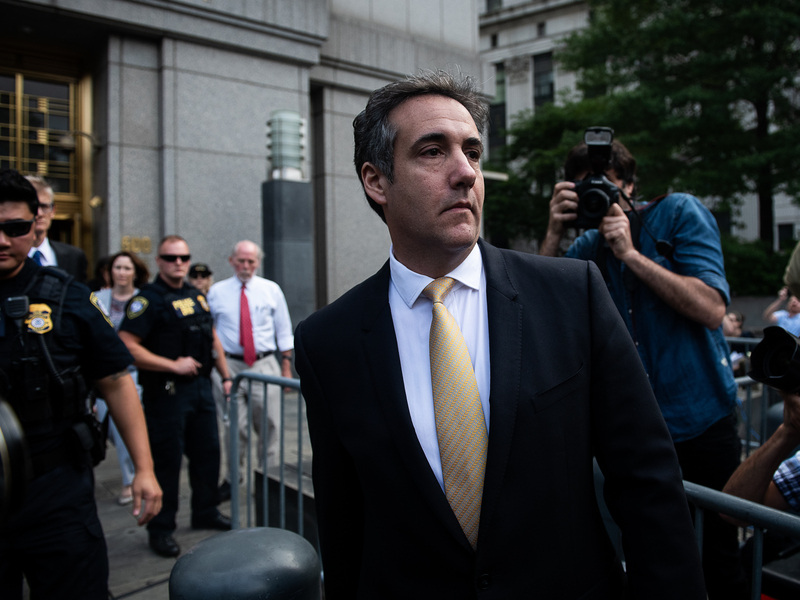 It triggered vows by Democratic chairmen of House committees to investigate and widespread discussion about the political implications of Trump's reported instructions to Cohen. "These allegations may prove unfounded, but, if true, they would constitute both the subornation of perjury as well as obstruction of justice," California Rep. Adam Schiff, House intelligence committee chairman, said in a statement earlier Friday. BuzzFeed Editor-in-Chief Ben Smith told All Things Considered on Friday night that his organization stands by its story. Smith said he stands behind his reporters and noted that BuzzFeed broke another story about the Russia project: that the Trump Organization planned to offer President Vladimir Putin the penthouse in the projected hotel. He said the reporters based their story on information from "federal law enforcement officials involved in the investigation, and well-placed to know what's going on inside it." He said the sources have "a remarkable track record" with these reporters. Smith said BuzzFeed is eager to hear specifically what the special counsel disputes in the article. He said it's hard to respond to the statement the special counsel released, which Smith described as "not a full-throated denial." Speaking to reporters on Saturday morning, Trump said he appreciated the special counsel's statement. "I think that the BuzzFeed piece was a disgrace to our country, it was a disgrace to journalism," Trump said, calling the story "phony." The back-and-forth heightened expectations for a hearing scheduled for Feb. 7 at which Cohen is set to appear before the House oversight committee. Democrats are expected to try to draw him out about both his verified and alleged actions on behalf of Trump; Republicans are expected to highlight the false statements Cohen has admitted to making, as part of a strategy to paint him as not believable. Friday's statement by the special counsel's office, meanwhile, was highly unusual. Mueller, despite the high-profile position he accepted in the spring of 2017 and the political stakes of his investigation into whether any Americans collaborated with Russia's attack on the 2016 presidential election, is famously silent. Despite the avalanche of press reports about its activities, the special counsel's office very seldom responds to news stories. In late 2017, however, it discounted a report suggesting it had obtained evidence improperly. Cohen was interviewed by the House intelligence committee in October 2017, and also provided written statements to House and Senate intelligence committees. But he pleaded guilty in November to one count of lying to Congress about the timing of negotiations with Russians about building a Trump Tower in Moscow. During the campaign, Trump repeatedly said he had no business in Russia. Cohen told Congress that those negotiations ended in January 2016. He later admitted that those talks actually continued at least through June of that year — well into the presidential campaign. Last month, Cohen was sentenced to three years in prison for a number of political and finance crimes. BuzzFeed's story, published on Thursday night, was reported by Jason Leopold and Anthony Cormier. Their sources said that Cohen "told the special counsel that after the election, the president personally instructed him to lie — by claiming that negotiations ended months earlier than they actually did — in order to obscure Trump's involvement," according to the report. In an interview Friday morning with NPR's Morning Edition, Cormier said their sources describe "quite a bit of documentary evidence" — in the form of emails, internal correspondence and witness interviews — that Trump told Cohen to lie. Law enforcement officers had gathered this evidence before Cohen was interviewed by special counsel Robert Mueller, according to BuzzFeed's sources. "And then Mr. Cohen, during his many interviews with the special counsel, confirmed that he was directed to lie to Congress," Cormier said. Cormier told NPR that while he and Leopold have not seen the documentary evidence themselves, their sources have personally reviewed it. "And we've managed to find ways to verify these people's stories off the record, through sourcing that we just weren't able to use in the story," he explained. Those sources told BuzzFeed that the directive did not come through an intermediary: "It's our understanding that it was directly from the president of the United States," Cormier said. NPR has not independently confirmed the allegations in the BuzzFeed report. Lanny Davis, Cohen's legal and communications adviser, told NPR: "Out of respect for Mr. Mueller's and the Office of Special Counsel's investigation, Mr. Cohen declined to respond to the questions asked by the reporters and so do I." The allegations leveled in the story are serious. "This is a crime if it's true, and our reporting suggests that it is," Cormier says. Trump took to Twitter on Saturday to criticize the BuzzFeed report and the media coverage that followed its release. In a tweet Friday morning, Trump accused Cohen of lying. Kellyanne Conway, counselor to the president, told Fox Business Network on Friday: "And also I'm very very dismayed that the sourcing in this particular article are two law enforcement officials who are connected to the investigation. That should send a chill down everybody's spine. People should not be leaking information from investigations." Trump's current personal attorney, Rudy Giuliani, had this response: "Any suggestion — from any source — that the President counseled Michael Cohen to lie is categorically false. Michael Cohen is a convicted criminal and a liar. To quote the prosecutors, he has traded on 'a pattern of lies and dishonesty over an extended period of time' and for that 'he is going to pay a very, very serious price.' "
Cormier told NPR that Cohen is not the source for their story and that "he is not the one who told us this." "We are reporting that it is not just Michael Cohen's assertion to the special counsel — that this team of investigators has gathered other evidence to support the statements," Cormier said. In his statement Friday morning, Schiff said the House intelligence committee would investigate what he called "a counterintelligence concern of the greatest magnitude." "Given that these alleged efforts were intended to interfere with our investigation, our Committee is determined to get to the bottom of this and follow the evidence wherever it may lead," Schiff added. The chairman of the House Judiciary Committee, Rep. Jerrold Nadler of New York, said his committee would investigate as well. NPR Justice Department correspondent Ryan Lucas contributed this report.